Abstract: Traditionally genetics has held a protein centric view with RNA seen as an intermediate step between DNA and protein. Recently, the emerging evidence of pervasive transcription throughout the genome has challenged this view1,2. Long noncoding RNAs (lncRNA) are selectively expressed during different cell cycles3 as well as transcribed differently in specific cell types4, which emphasizes their importance in regulating cell specification. lncRNAs can work on every stage of transcription from chromatin remodeling, controlling transcription to post-transcriptional processing through various mechanisms such as directly binding to transcription activation sites, working as decoys for transcript suppressors/activators or as guiding/scaffold molecules for chromatin remodeling complexes5. 5. T. R. Mercer, M. E. Dinger et al. 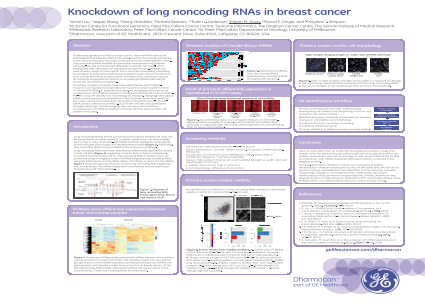 Long noncoding RNAs: insights into functions.